We're less than a month away until the midterms. Here are five essential questions. 1. Can Republicans continue to close the enthusiasm gap? One of the Democrats' chief advantages this midterm season has been that they’ve been much more fired up about the upcoming election than Republicans have. But our NBC/WSJ poll has showed that Republicans have been closing the enthusiasm gap — and that was before Kavanaugh, who galvanized Republicans. Did the last three weeks provide the GOP with a sugar high or rocket fuel? The difference could very well decide which party wins in November. 2. Do independents keep breaking the Democrats’ way? 3. What will Trump say and do over the next four weeks? A surprising development in the Kavanaugh-Ford story was how it overshadowed President Donald Trump. Yes, he mocked Ford, and he gave that bizarre, nearly hour-and-a-half news conference at the U.N. But he wasn't the main story — the way he's been most of his nearly two years in office. Remember this about 2016: Not only did Hillary-Comey dominate the last two weeks of that presidential election, but it also coincided with Trump being incredibly disciplined during that stretch. Can he do it again? 4. Can Heidi Heitkamp make a comeback in North Dakota? Public polls last week showed Sen. Heidi Heitkamp, D-N.D. — who voted against Kavanaugh — trailing to Republican challenger Kevin Cramer by double digits. A Heitkamp loss means that Democrats have to run the table in Tennessee, Missouri, Indiana, Florida, Montana and West Virginia to win control of the Senate. But if she's able to mount a comeback, then the Democrats’ path to a Senate majority widens. Heitkamp's being competitive is the difference between Dems having a 30 to 40 percent chance of regaining the Senate or a 10 to 20 percent chance. 5. Do Democrats continue to have the edge in Florida’s and Wisconsin’s gubernatorial races? As Charlie Cook wrote last week, the true blue wave could come in the form of 2018’s gubernatorial and state-legislative races. “I expect net gains for Democrats in governorships of between six and a dozen, and a pickup for Democrats of between 400 and 650 state legislative seats, more than the average midterm loss of 375 seats for the party in the White House. These state elections are the most under-reported story in politics, with control of chambers likely tipping from Republicans to Democrats,” he said. The races to watch if Democrats are really having a good Election Night in the gubernatorial contests: Florida and Wisconsin, where their candidates are currently leading. After delivering remarks this afternoon at the International Association of Chiefs of Police Annual Convention in Orlando, Fla., Trump heads back to D.C., where he'll participate in a swearing-in ceremony for Kavanaugh, who already had his swearing-in ceremony on Saturday. “Congratulations Judge Kavanaugh! Instead of a 6-3 liberal Supreme Court under Hillary Clinton, we now have a 5-4 conservative Supreme Court under President @realDonaldTrump, cementing a tremendous legacy for the President and a better future for America,” White House Press Secretary Sarah Huckabee Sanders tweeted on Saturday. The Kavanaugh confirmation is a political victory for Trump and the GOP. And it took place in a week when the unemployment rate fell to 3.7 percent. But the week, notably, also coincided with some very low moments for the president — his mocking of Ford, the devastating New York Times investigation about his family's tax schemes and "outright fraud." Per NBC's Geoff Bennett, Trump will make four campaign stops over the next week — in Council Bluffs, Iowa on Tuesday (IA-3); Erie, Pa., on Wednesday (PA-16, PA-SEN); Lebanon, Ohio on Friday (OH-SEN); and Richmond, Ky., on Saturday (KY-6). A new Washington Post/Schar School poll of nearly 2,700 likely voters living in 69 House battleground districts finds Democrats ahead on the generic ballot by 4 points, 50 percent to 46 percent. "By way of comparison, in 2016 these same districts favored Republican candidates over Democratic ones by 15 percentage points, 56 percent to 41 percent." More: "Women are driving Democratic support in the battleground districts, favoring the party's candidates by 54 percent to 40 percent. Men in these districts favor Republicans by 51 percent to 46 percent. That gender difference continues a pattern that has been seen throughout the year in other polls and in special elections." And: "Of the 69 districts included in the survey, 63 are held by Republicans and just six are held by Democrats. Trump carried 48 of these districts and Hillary Clinton won the other 21. In the districts won by Trump, likely voters are split 48 percent for the Democratic candidate and 47 percent for the Republican. In the districts won by Clinton, Democrats enjoy a clear advantage, 53 percent to 43 percent… The president’s job approval rating among likely voters in these battleground districts stands at 43 percent." The Kavanaugh confirmation nearly broke the Senate. Can it recover? NBC's Leigh Ann Caldwell: "The battle to nominate Supreme Court nominee Brett Kavanaugh has deepened division and distrust in a chamber already fraught with partisan fights, ripe with raw emotions and filled with frustration among senators who say this is a low point in the body's existence. While there’s hope among senators on both sides of the aisle that it can recover, it's not clear how that happens." "With the stakes so high, any Senate decorum that remained during an already polarized era has dissipated, and the mood among senators of both parties reflected that. 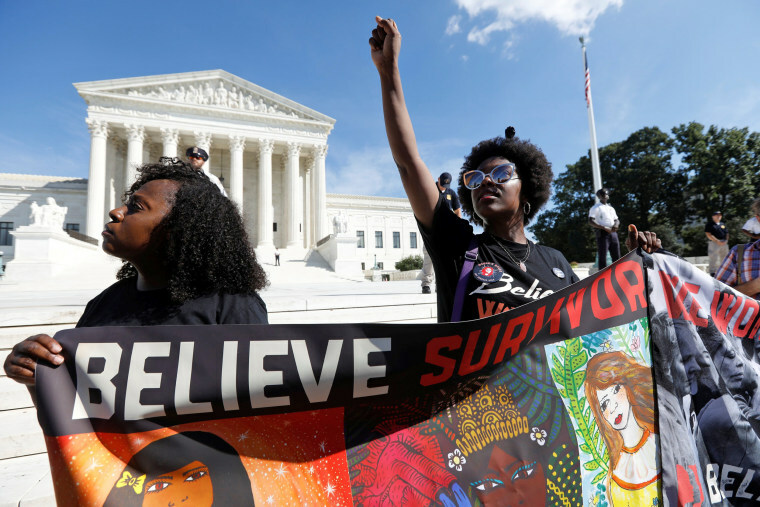 'I love the Senate, but I’ve never been so appalled at this intuition,' Sen. Brian Schatz, D-Hawaii, told a handful of reporters this week as the Kavanaugh's confirmation appeared imminent." "Sen. Susan Collins, R-Maine, a pivotal vote for Kavanaugh who had been the target of extreme pressure from groups on the left and the right, called the confirmation process a 'dysfunctional circus.'" By the way, early voting begins today in California and Iowa — joining Minnesota, Illinois and New Jersey, which started theirs in September. On Wednesday, the key 2018 states of Arizona, Indiana and Ohio start their early voting. The “Meet the Press” Film Festival with the American Film Institute (AFI) hits the big screen this fall for the second year, featuring nearly two dozen films spotlighting critical issues ahead of the midterm elections. This year's festival will be held at the Landmark Atlantic Plumbing Cinema in Washington, D.C. on Monday evening and will feature 23 short-length documentaries from HBO, Netflix, The New York Times, and other filmmakers across the country.